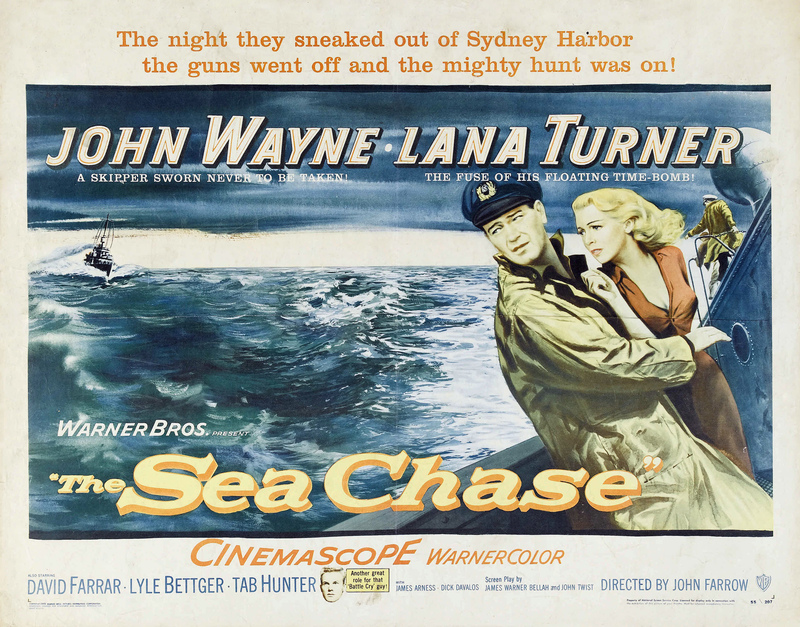 THE SEA CHASE is a disappointingly slow adventure, which finds a merchant ship leaving Australia after war begins in 1939. It attempts to make the North Sea, via Valparaiso and Panama, as the British pursue. 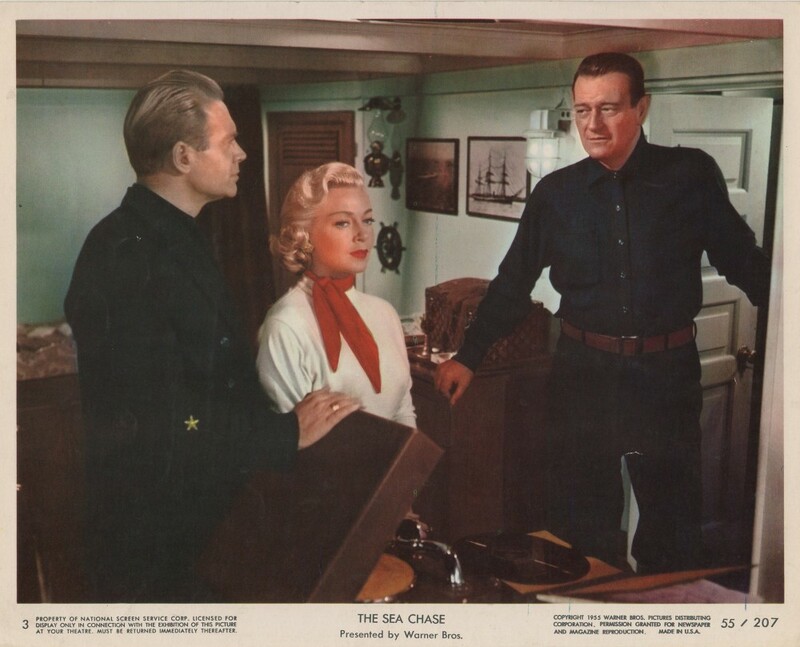 The ship is German, which makes this a strange outing, as most of the cast are hard to accept as Europeans, not least stars John Wayne and Lana Turner. Be a good boy and fetch my schnapps! 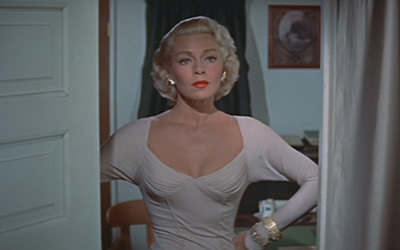 Wayne’s not bad (this was his mid-50s period when he diversified from westerns), but it’s just too much to accept him as German, and Ms. Turner suggests Bel Aire more than Bremerhaven. They didn’t hit it off during the shoot. Her personal life (always a mess) continually interfered with the production, and her hangovers played havoc with their scenes together, plus she was being constantly pursued by the director, John Farrow, who was trying to bed her. Meanwhile, Wayne got an ear infection, and felt the Lana-lusting director killed the films potential. The $3,000,000 budget was recouped by grosses of $7,100,000 (coming in #8 of the years hits), but reviews were dismissive. Of the cast, only crack villain Lyle Bettger makes a believable foreigner, his looks and sneer do an effective job of suggesting a Nazi. Wayne gets to bat him around, which is reasonably amusing. The whole 1955 package is pretty much a 117 minute yawn. With David Farrar, Tab Hunter, John Qualen, Richard Davalos, James Arness, Paul Fix, Luis Van Rooten, Alan Hale Jr., Peter Whitney, Claude Akins, John Doucette.